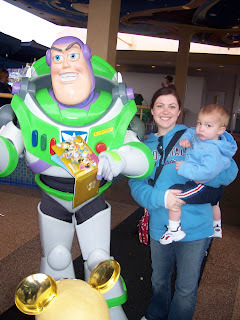 I know this is crazy, but I got my own laptop computer since our other computer is in storage in Phoenix (see 3rd post down) and downloaded all my pictures I have been taking here and just had to get back into the blogging world. Hopefully, those of you who used to check my blog will come back. I now, do not have to go to the computer room in the hotel and wait to get on, I can do it in my room or outside by the pool (just had to put that in for those of you still in winter mode). Sorry for all the posts, but alot has happened and I have had many family birthdays while I was down and out. Happy 50th, Gary!!!!! Join the club. Also a shout out to Dennis for his birthday in March. We spent it in California with Dennis' Mom and Karen and Dave and family. Oh yeah, also a shout out to Karen, she just had her 40th!!!! I know you don't want to be reminded about it, Karen, but oh well. I will try to keep up on this now, so that I don't have so many to do all at once. Will also update on our move (again). Hopefully, we will have a place soon and can get our things out of storage and start real life again. I feel like I have been on a semi-permanent vacation for the last several months and my kids like to keep reminding me that I am on vacation. Oh to make a bed, dinner, or clean a toilet. I can't believe I am to the point that I am really missing that. This Too Will Pass! On April 9th Brock turned 5 years old! This picture is of Brock when he went to the Spring Training Baseball game for Dennis' work. He got a Spiderman painted on his face and at the baseball game had one of the Oakland A's players throw him a baseball and then we got it signed after the game. He had a great time and would hold up his baseball mitt whenever the team came into their dugout in hopes of getting a ball. The crowd in the stands all cheered when the player pointed to Brock and gave him the ball. Brock was so embarrassed!! But what a thrill! I was in St. George on Brock's birthday and was able to celebrate with him at his party. He is such a happy boy and is so smart! I got to go and see he and Dylan play t-ball, celebrate Brock's birthday and then color eggs and go on several Easter egg hunts. It was such fun! I just love spending time with the three boys. There is nothing like it! Okay, so Dennis and I have been in Phoenix since January. We have looked for a house for serveral of those months, and even made offers on a few of them. Then in March, Dennis' company said that we should hold off on the home because we might be moving to California. So for the last few months, it has been sun and (?)fun. My home has been the Paradise Valley Doubletree Hotel in Scottsdale. My friends are all the morning servers at the hotel. Ayu, Rodica, Elberto, Thuzan and Kathan know me and some of my family that has been to visit. They know what I like when I come for breakfast and we talk about their families and what they have been doing on their days off. My usual day during the week consists of either shopping (no summer clothes brought with me), eating out, sittin g out by the pool, swimming and when I can get to a computer, doing a little every day business and sending in expense reports. On weekends when Dennis is in town we head out. Tucson, Sedona, Grand Canyon, Lake Havasu, the lakes, ghost towns and anywhere else that sounds like it would be fun. We have gone to several spring training baseball games and one Diamondback game. We love the desert, the scenery, the cacti and the citrus trees. We have been here through the harvest of the citrus trees, the blooming and the smell of citrus in the air, and right now the cactus are in bloom or some just blooming. We are still waiting for the final word on our move to California. We will be moving to the bay area by Dennis' Mom and Karen and Dave. They are really excited and we will be too once this gets going. I really like this snowbird thing here in Arizona, I have fallen in love with Arizona and I hope that each winter will find me down here f or a while. Here are some of the pi ctures of the fun we have had here. Who knows how much longer we will be here for, but I have been loving it while here. Yeah, Arizona! Beth had her tonsils out the first of March and came down to Phoenix with me to recuperate. One of the last days she was here, we went to an Oakland A's vs San Francisco Giants spring training game. The A's won. This is Jason Giambi, a really good player on the A's team, he was down signing autographs after he hit a home run first time up to bat, and played a few innings. We went down, got an autograph, and Beth got a picure with him. We had a really fun day and was glad that Beth finally felt up to getting out. On April 7th, Beth turned 27. I have been so out of the loop lately, so I felt like I would catch up now. Beth is a great daughter that has had her struggles. We love her and are so proud of her and all she has accomplished. She is so loving to her family and especially to her nephews, who she loves dearly. One day she will make a great Mom. Happy Belated Birthday, Beth! We love you! We had a great time in California for Thanksgiving this year. Thanks to Karen and Dave, Ken and Steph, and Mom Harper for putting on a great feast! It was so nice with Beth and Chad, Kevin and Andrea, and Tyler there to join us. We had a great dinner (and it was even served on time, amazing!) We had a great time visiting and playing games afterwards with everyone. Then the next day was shop, shop, shop! 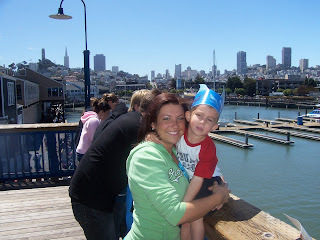 The young ones and Karen and kids, went to San Francisco later in the day and that night. They had a great time and enjoyed the sights. Thanks to all for a great weekend and great hospitality! Then we drove back to Salt Lake City with both of our vehicles and Dennis took off for Arizona. 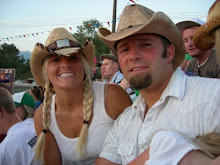 He spent the first week down there getting acquainted with his new job and I stayed in Utah. We are both going to be going down there tommorrow for a week of house hunting and warm weather! 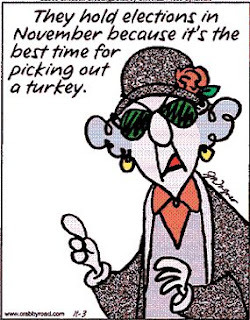 Hope all had a great Thanksgiving and are looking forward to the Christmas holidays. Don't know if Christmas Cards will be going out this year or not, but will really try. Now, back to work! As I am typing this, the movers are here packing everything up to be put in storage in Phoenix. Dennis and I have been very busy trying to get all the last minute things done here before we move. 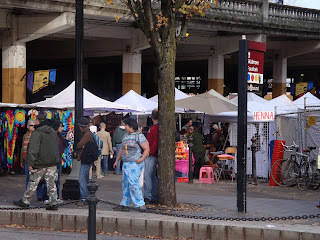 One of my favorite things to do here, has been to go down to the Saturday Market in downtown Portland. 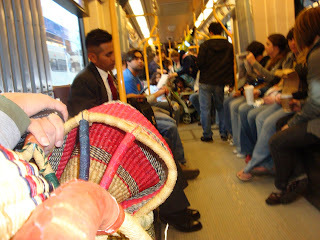 We usually walk down from the Lloyd Center Mall across the river and then take the MAX back. Here is some of the pictures of our last trip. 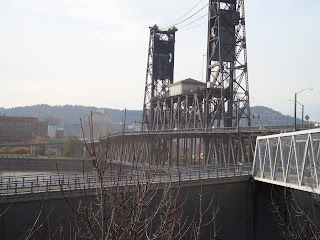 This is the steel bridge that we walk over to get to the market. The MAX and cars and the train also all go over this bridge. It raises in the center when the large ships go out to the Columbia river and to the ocean. The second picture is off part of the Saturday Market, it is usually packed with people, fun items for sale, food, and some interesting entertainment. 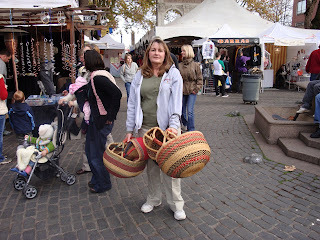 This is me with my favorite find at the market, I love these baskets! They are made in Africa and a native sells them here at the market and sends the money back to the people there (so he says) They are the best baskets and so strong and beautiful colors. Dennis has to wait everytime while I decide which one I want. No meaningful experience of Portland is complete until you ride the MAX trains. They are always packed with people (at least I think some of them are people). Very, very interesting! I also wanted to post a picture of the view of MT. Hood from the area, but it has been cloudy for the last week or so, so you can't see it. On a clear day you can see Mt. Hood towering above the skyline with a touch of snow on the top. It is so beautiful! Sometimes you can even see Mt. Adams in Washington and Mt. St. Helens in Washington. I will really miss that view! I will just have to get out and see Phoenix area when we get settled there. Goodbye rain and hello sunshine! 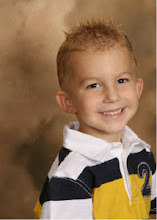 My oldest Grandchild, Dylan, turned 6 on Saturday, November 8th. He shares his birthday with his Mom, Lisa. 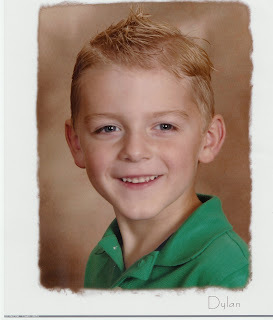 Dylan has started kindergarten and is really enjoying school. He is so smart and has a memory that is great! 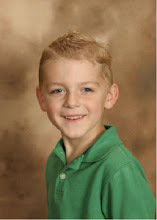 He had a rocky start when he was born and spent many days in the hospital. He has had 4 different operations before he was even 2 years old. He is strong and healthy now and you would never know what a hard time he had when he came to this earth. Dylan is a great big brother and watches over his brothers Brock and Kaden. He loves to play and read and has many friends. He has the most tender heart, and can get his feelings hurt very easily. He loves to go to the football games with his mom and dad, even though, I think he is more for the Utes instead of the Cougars. He had a great birthday in Salt Lake; going to the BYU game, going to Chuck E. Cheeses, going bowling and loosing his very first tooth! I feel so bad that we missed all of this fun, but Beth posted on her blog, pictures of all the fun things that they did. Next year we will live close enough to celebrate with him and I can't wait. 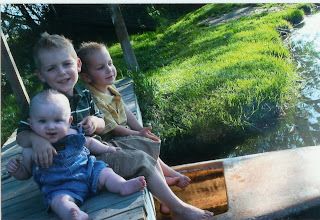 This picture is one Beth took of the three boys a year and a half ago. Aren't they the cutest! around and gives the best hugs ever. She is the mom of 3 great boys and keeps plenty busy with that. She is a great addition to our family and we love her tons! I hope you had a great birthday Lisa and had some fun! After a year here in Oregon, we have absolutely loved it, but another change is in the works. The end of November we will be packing up the house again and moving to sun, palm trees, and did I say sun; We are moving to Phoenix, Arizona. Dennis has an incredible opportunity to go to work for a solar company in Arizona. He will be the Director of Development and will have an office in Tempe, Arizona. He starts his job there on December 1st, so we are moving everything out of Oregon before Thanksgiving and then driving to Salt Lake and then he will fly out of Salt Lake to Arizona on the 1st and I will hang out in Utah for a while. We will spend December and January, back and forth between Arizona and Utah. Our furniture from here will go to Phoenix and be put in storage until we find a house down there. We will really miss the Northwest and all the fun things to do here and all the trees, ocean, and water. After 13 days of rain here though, the sun it looking better and better. My blogging may go by the wayside for awhile, while we get settled into the new job and new area, but I will try to keep up. We are looking forward to being closer to our family, and hopefully they will come and visit us now ( they will have to if they want to go boating, as the boat is coming with us this time). See you all soon! My friend, Kim, sent me this and I thought it was so cute, just had to post it and give you a laugh on this election day. I know some may be sad, or mad tonight when the winner is announced, but remember, at least we got to vote for who we wanted to lead our Country. I for one will be glad when this is all over and settled. I am a little fearful for our country under one of the candidates, but hopefully, he will do the best he can for all people and not just an elect few. Whoever it is I hope that they will turn to God for guidance and help in leading this great country of ours. You can't go wrong if you have his help! Happy Voting Day! Dennis and I were married on May 6, 1978 in the Oakland Temple. We met at Ricks College, even though he lived in the same Stake in California as my Dad. My step-sister, Juanita, knew Dennis and introduced us as soon as we got to Ricks. I found out later, Dennis would come over when he knew I was home and Juanita wasn't, just to see me. We dated and the rest is history! We have lived in a lot of places since being married; Vacaville, Calif., Boise, Idaho, Springville, Utah, Seattle, Washington, Provo, Sandy, and Draper, Utah. We currently are living in West Linn, Oregon, by Portland and loving it! We have 4 children, Erik, Kevin, Beth and Tyler. 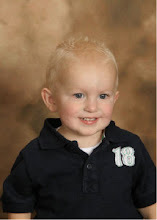 I have three of the cutest grandsons; Dylan, 5; Brock, 4; and Kaden, 2. I love being a grandma and getting to see the boys! The oldest are all married to wonderful spouses that we have welcomed into the family and Tyler is still at home and looking. We have been married 30 years this year and they have been the hardest and the happiest. My favorite things to do are to sew, do flowers, be with my family, anything outdoors, and travel. Dennis and I are enjoying our time in Oregon and love to spend weekends on the coast.